In an effort to reduce loosening rates in orthopaedic surgeries, manufacturers have introduced various cementless technologies, including porous coatings to improve adhesion at the bone-implant interface. Retrieved porous orthopaedic implants are assessed utilizing a standardized point counting technique to determine extent of ongrowth. 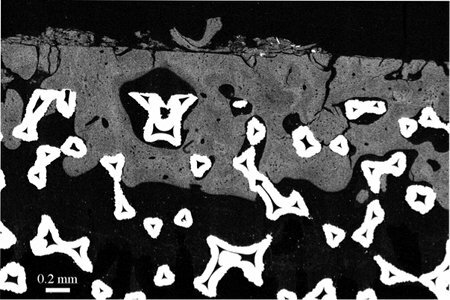 Implants are then dehydrated, embedded, sectioned and imaged using backscattered-SEM. Images are analyzed to determine percent of bone ingrowth and maximum depth.